2 months 2 weeks ago	#1528 by Pascale R.
Omit certain colors when using "Cycle Used Colors" was created by Pascale R.
Would it be possible to omit certain colors from being used when using the "Cycle Used colors"? I have an applique design (manually digitized) that uses different colors for placement, tack, and final cover. I don't want the placement & tack down colors to be included in the "cycle used colors" scheme. Two objects have to remain brown regardless of all the other colors. I'd like to see these other colors cycled, but I don't want to include the brown color. 2 months 1 week ago	- 2 months 1 week ago	#1578 by Pascale R.
Replied by Pascale R. on topic Omit certain colors when using "Cycle Used Colors"
Antony mentioned this in another post "Shouldn't the thread colour of locked object be locked as well? When use "Cycle Used Colours," it shouldn't be affected? In my opinion. once the object is locked, nothing of it can be changed (apart from hidden from view if desired) unless unlocked." That would work! Since one can't change the colors of a locked object, it makes sense (at least to me with this scenario!) that it wouldn't be affected when using the "Cycle Used colors". 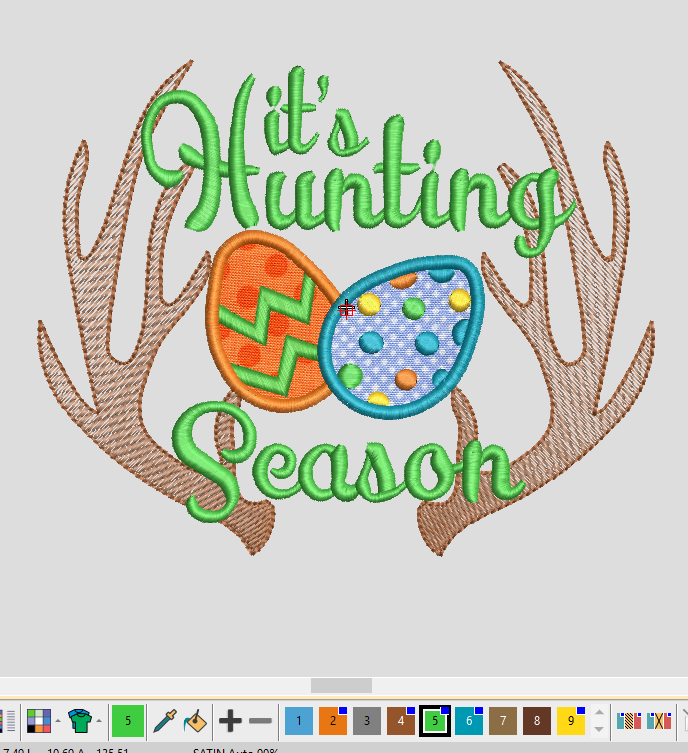 As an example ... in this design I'd like to see what the text & eggs would look like when colors are cycled, BUT without including the manually digitized applique placement & tackdown stitches or the antlers! If I locked those objects, and Antony's idea worked, it would prevent the placement, tackdown and antlers from being involved. super cool! Replied by antony on topic Omit certain colors when using "Cycle Used Colors"
I was thinking that if the having another control option (to omit from cycle used colours), that would work, but can make things more complicated, as well as being trigged by mistake and people wonder what went wrong. To me, "locked" means all properties should be locked. Replied by Hong on topic Omit certain colors when using "Cycle Used Colors"
Thank you for your request. I have raised an issue to include the requests from both of you.